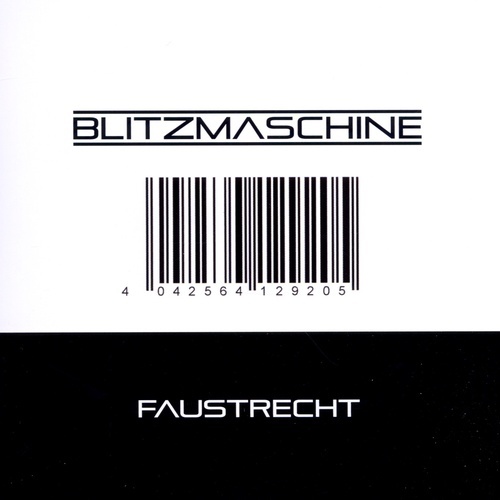 From the use of classic EBM basslines and minimal vocals to complex song structures and musical arrangements BLITZMASCHINE shows on "Faustrecht" what they understand about electronic body music. ‘Faustrecht’ is a fresh and promising debut for this German act and features a high number of potential club hits to dance and rave to, if you are into minimal EBM of the 80ies! To the more ‘classic’ EBM sounds, Blitzmaschine occasionally add slight elements from different electronic variations in music, that enrich and complete the whole product in an excellent way. A debut that should be received with acclaim and that should easily establish Blitzmaschine as one of the most promising Newcomers of the German EBM/Minimal-Electro scene!